The Perfection Loop Knot is a knot used to conntect hooks, lures and swivels to fishing line. But, is most often used by fisherman as a quick connection between leaders and the main line. The Perfection Loop Knot is tied at the end of the leader to reduce the time a takes to switch them out while on the water. With this knot in place, switching leaders will only take seconds. 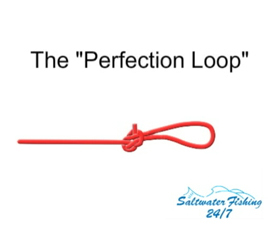 How To Tie The Pefection Loop Knot -- The Perfection Loop Knot is a knot most often used by fisherman as a quick connection between leaders and the main line. With this knot in place, switching leaders will only take seconds. How To Tie A Snell Knot -- The Snell knot is considered a hitch knot and is primarily used to attach a line to a hook. The snell knot is still useful today mainly because of its 100% hook strength and reliability. How to Tie A San Diego Jam Knot -- The San Diego Jam knot, also known as the Reverse Clinch knot, is a knot that is extremely strong. It is often used to secure your hook directly to main lines, it doesn't sacrifice flexibility, and is very easy to tie. How To Tie A Rapala Knot -- The Rapala knot was developed by the Rapala Company to not impede a lure’s action, allow it to run true, and to look more realistic during the retrieve. It can also be used to attach monofilament and fluorocarbon leaders.